We love items that are decorative as well as functional! 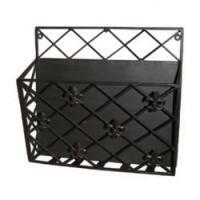 Our Old World Fleur-de-lis Wall Organizer is just that. Perfect for stowing away magazines and newspapers or to organize your papers or mail. This striking fleur-de-lis magazine, mail or office file organizer mounts to the wall, clearing your counter tops and desk from clutter. Hang multiples for maximum storage capacity. So versatile it can be used in a kitchen, mudroom or bathroom and a home office or study. For more details visit www.cheapchicdecor.com.